Our desire for ALL who visit GENESIS for one of our worship gatherings on Sundays is that you would connect with God and others in a meaningful way. Our prayer for ALL who come is that you will be challenged, loved, encouraged, blessed, and inspired. God is doing some amazing things in the lives of people at GENESIS and we firmly believe that He wants to do that for you as well. In order to make your visit to GENESIS as smooth as possible, here are a few things that you can expect when you arrive. When you come to the front door, you will be greeted with a smile from someone on our Greeting Team. You will be handed a bulletin highlighting what will be happening in the service that day along with updates as to what’s happening within the GENESIS community throughout the week and in weeks to come. Before you head into the sanctuary, make sure to stop by the GENESIS Café to grab some coffee, tea, hot chocolate, seltzer, a bottle of water, or some pastries. Coffee is provided by Starbucks. All drinks and pastries are FREE. GENESIS Kids offers FULL programming at all three worship gathers (8:30, 10:00, and 11:30 AM). If you have children from age 6 weeks through 5th grade, please stop by the GENESIS Kids Welcome Center before you head into the sanctuary to meet some of the teachers and check your children into the GENESIS Kids space. We’ve got an incredible team of volunteers who are committed to providing a safe, fun environment for your children. They are also committed to teaching them the truths of Scripture and of God’s great love for them. Do you have a newborn? The Lounge is the place for you. We have a private area for you to enjoy the worship experience while still giving your child the attention that they need. GENESIS offers three identical worship gatherings at 8:30, 10:00, and 11:30 AM. A typical service will begin with two or three worship songs. 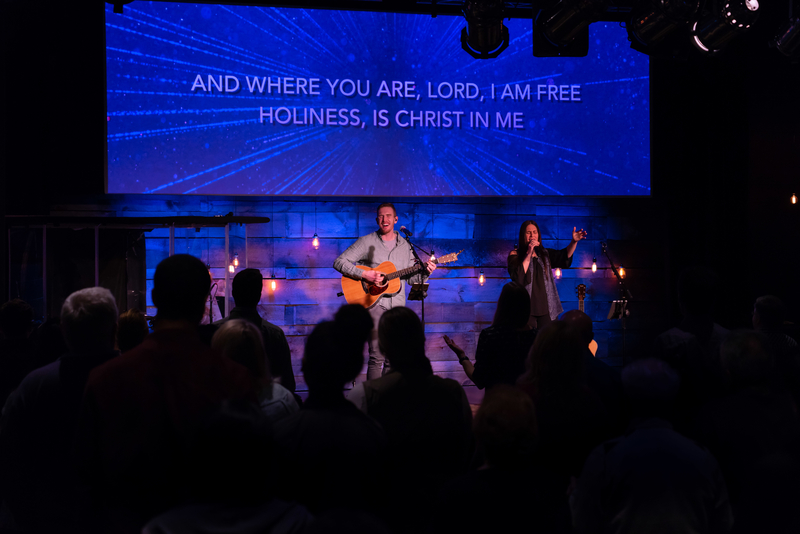 Worship is led by the GENESIS worship band, which is comprised of acoustic and electric guitars, bass, keys, drums, djembe, violin, saxophone, and voices. We sing songs from artists such as Elevation Worship, Hillsong United, Bethel Worship, and Vertical Church Band. After the first set of worship songs, one of the pastors will preach a 30-minute message from the Bible. Following the sermon, GENESIS celebrates communion every week. There are 12 communion stations set up at the front of the sanctuary. ALL who have made a decision to become a Christian—a follower of Jesus—are invited to participate in communion. Each communion station offers wine, juice, bread, and gluten-free bread. We end our worship gathering with some worship songs and a closing prayer. A typical worship gathering is 60 minutes. If you have something that you would like prayer for—whether it be for you or for someone else, there are two things that you can do. Prayer Cards. Located in the chair pockets, you can write your prayer(s) on the prayer cards and place them on the plates located on the communion stations at the front of the room. Each of these prayer cards is faithfully prayed for during the week by our leadership team. Pray with our prayer team. At the end of every gathering, men and women from our prayer team are available to pray with and for you. If you are new or newer to GENESIS and would like to learn more about getting connected within the GENESIS Community, then please stop by The Living Room before you leave. Members of our leadership team will be there to meet you, answer any questions you might have, and share with you the story, mission, and vision of GENESIS. And just for stopping by, you'll receive a very hip GENESIS t-shirt! Located throughout the GENESIS space are Tithe + Offering Boxes. We do not take a formal offering during our worship gathering, but all are invited and encouraged to support the ministry and mission of GENESIS through the giving of tithes and offerings. If you’d like to support GENESIS, you can also do so electronically. If you are in need of a Bible or have a friend that you would like to give a Bible too, there are FREE Bibles for you to take located at each entrance to the Sanctuary. GENESIS gives away NLT, ESV, Spanish and Portuguese Bibles.